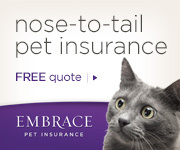 The Cat Doctor & Friends recommends the Embrace Pet Insurance for your insurance needs. Ask about a free trial offer on your next visit to our hospital. Click on the cute gray cat above to be directed to their website for further information or call 1-800-511-9172. Insurance has helped our client Shaudi and cat's heart problem. Her Claim totaled $582.95 and Embrance Pet Insurance covered $582.95. Embrace Pet Insurance has done it again! They have helped our client Jeanine and her cat on a stool problem. The claim totaled $562.19 and Embrace covered $502.40. We would like to thank Embrace Pet Insurance for helping our clients. Our mutual client Tara submitted a claim totaling $1810.24 and Embrace covered $1771.25 for her cat's urethral obstruction treatment. It's nice to know our clients are being taking care of. We received a really nice postcard from Embrace Pet Insurance today. Our client Allison submitted a claim for her cat's bladder stone treatment. The claim totaled $532.78 and Embrace covered $510.00! Thank you Embrace Pet Insurance.